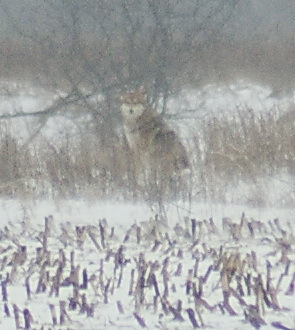 On February 2, 2013 my partner and I spotted an animal running through a field near the Blair Trail in Cambridge. We figured it was a lost dog and called the SPCA, but we were intrigued by its wolf-like colouring and snapped a couple photos from afar. The next day we went back to the site and I followed many tracks, finding one set that forked into two. One animal had been following directly after another! It seems unusual for a pair of dogs to be lost, so I think it's a Coyote. I've looked at tons of pictures online of Coyotes and Wolves and can't be sure what this beautiful animal is. Wow, thank you for sending this to us - your picture is really good but I'd hate to say whether it is a Wolf or a Coyote. If it's a Coyote it is a really big one! The markings look more like a Wolf to me. Perhaps one of our readers will know for sure!